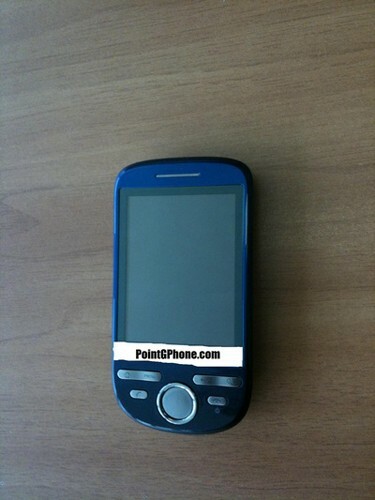 HTC Click in the wild -- Android on the cheap? Not satisfied with your Android selection? Looking for something a little easier on the pocketbook, perhaps? Well, that's cool, partner -- look no further than the HTC Click. This thing hasn't been announced, but rumors have been swirling for a few days now that the Click would be taking HTC's Android ambitions decidedly downmarket, and like clockwork, we've now got a couple alleged pictures of it. We can't verify the authenticity of this stuff, but we certainly don't have any reason to doubt that it's real -- it's pretty much what we'd envision a low-end HTC Android phone would look like. One open question would be the mystery surrounding that crazy pad arrangement where we'd normally expect a trackball to be -- don't get us wrong, we're not married to the trackball by any stretch, but it'll be interesting to see how well this works in practice. We don't have any details on the Click's release, but you can bet your sweet little green robot we'll be passing that on just as soon as we get it. HTC Click in the wild -- Android on the cheap? originally appeared on Engadget Mobile on Tue, 21 Jul 2009 14:01:00 EST. Please see our terms for use of feeds.